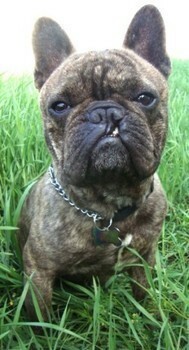 Elvis is a 2 year old french bulldog that has the most unique look to him. He has a cleft lip that is why his tooth sticks out in front a little. It was a birth defect that affects him in no way other than that he can make some unique sounds. 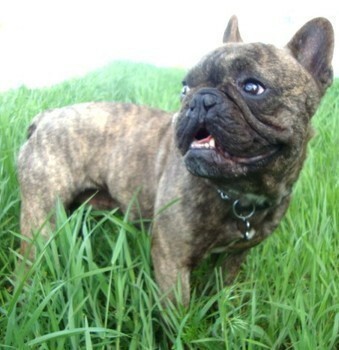 Elvis is a very pretty brindle color that makes him stand out and he just adores people. 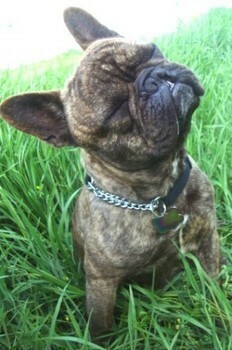 Elvis loves to play with toys, go on walks, or just cuddle on the couch with his owners. Elvis gets along well with other dogs but is a possessive type, for example, if his owner is sitting on the couch and some other dog would get up there while Elvis is up there he would get upset. It’s not him being intentionally mean but he does have the possessiveness attitude about whoever his owner is. He is good with children, and is full grown at around 20lbs so he is as big as he looks in his pictures. Elvis comes up to date on shots, micro chipped, heartworm tested, and neutered. Elvis is a very loving dog but would probably do better in a home where he is the only dog. If you are interested in giving Elvis his forever home please click the link at the top of his bio to fill out a application, thank you!